Home Facebook Convert Facebook Profile Into Page. Convert Facebook Profile Into Page. Do you want to know how you to convert Facebook profile into page then your are at perfect place because today I'm gonna teach you a step by step guide on how you can convert Facebook profile into a page. I don't think it makes any sense here to tell you about a Facebook page or the advantages or disadvantages of Facebook page. Its really nothing but only waste of time to discuss these simple things here. You may also like- Accept All Friend Request On Facebook In One Click. You may also like- Get Unlimited Facebook Likes In Just 5 Minutes (Step by Step Guide). So lets just directly come to the point how to convert Facebook profile into page. Step 1 :- First off all login to your Facebook account which you want to convert in Facebook. Step 2 :- Change your account name in desired name which you wanna see as your page name or if you wanna make your page with your current account name then skip this step. 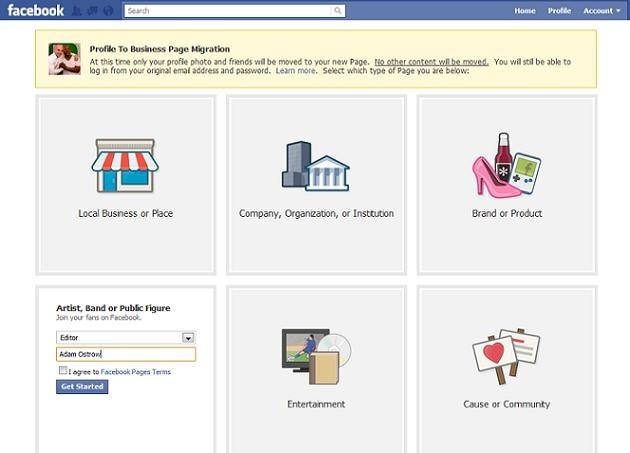 Step 3 :- Now just go to this link and download or backup your all Facebook profile information for safety purpose. Step 4 :- Now go to this link. Step 5 :- Now above link will directly take you to the page where you can easily convert Facebook profile into page. Just follow the simple instructions on that page. You may also like- Get Unlimited Friend Request On Facebook (Step by step). You may also like- How to Disable Facebook Seen Message In Chat. Now you have successfully learned how to convert Facebook profile into page. But if you still have any problem in any step then feel free to comment bellow, I'll try my best to help you out.